In the gallery, September 14th – 16th. 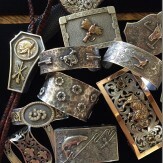 We welcome the return of Clint Orms Engravers & Silversmiths, and an expanded selection of hand crafted buckles, bracelets, and bolo ties. We have a long standing relationship with this exceptional artist, who continues to raise the bar on the legacy of the west. Works will be on view from 10am to 6pm September 14th – 16th. If you have a custom design idea or would like suggestions, we excel at these! To see current pieces by Clint Orms, click here.